In 2018, Mike E. Smith became the rider of Justify, who, after winning two races with the horse in California, won the 2018 Kentucky Derby. In doing so, the horse broke the 136-year-old "curse of Apollo" by winning the Kentucky Derby without having raced at 2 years of age. Two weeks later, Justify and Smith won the 2018 Preakness Stakes and then, on June 9th, 2018, at the 150th Belmont Stakes, Justify, ridden by Smith, became the 13th Triple Crown winner. In doing so, Smith, at age 52, became the oldest jockey to win a Triple Crown. 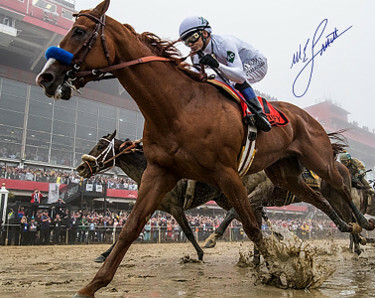 Mike E. Smith has hand signed this Justify 2018 Preakness 16X20 Photo. Steiner Sports Hologram and Certificate of Authenticity.